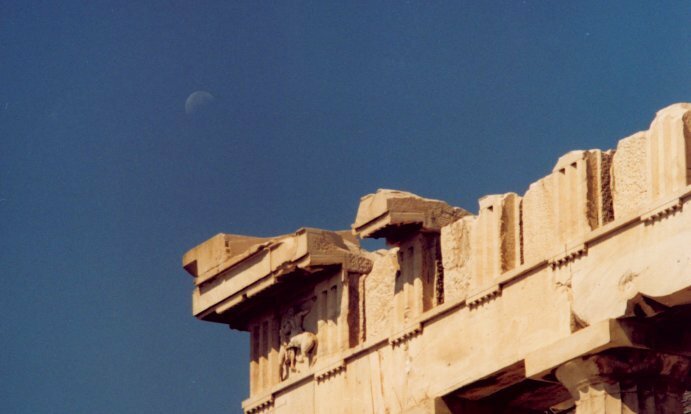 Photo of the Week.. Two ancient ruins: the Moon glows faintly over the corner of the Parthenon in Athens. Astronomy news for the week starting Friday, October 17, 2003. The Moon begins the week just shy of its third quarter, the phase actually reached on Saturday, October 18, just about the time of sunrise in North America, allowing us to see very close to the "perfect third" when it is high to the south, rather well above the ecliptic, and glorious in the growing dawn. Having passed Saturn the morning of the 17th, the Moon will appear at its third quarter to the northeast of the ringed planet. Continuing its perpetual course through its waning crescent phase, the Moon passes Jupiter the evening of Tuesday the 21st. The morning of the 21st thus sees the Moon to the west of Jupiter, while the following morning the thinning crescent shines prettily to the east of it. While Venus climbs ever so slowly to the west-southwest in bright evening twilight (and is still quite difficult to see), and Mars continues its bright and obvious easterly procession in southern Aquarius (the red planet so very nicely visible to the south in the evening), Saturn now begins to make an impact on the nightly sky, rising about 10:30 PM Daylight Time. Situated high along the ecliptic in central Gemini, Saturn rises almost exactly the same time as Betelgeuse in Orion, the Hunter seen nicely just past the meridian to the south as dawn brightens the sky. At the same time note brilliant Sirius lower to the south. About half an hour after Mars sets (around 3 AM Daylight Time), bright Jupiter rises, and later dominates growing morning twilight. Lost among the bright planets are much dimmer Uranus (in Aquarius) and Neptune (in Capricornus). Neptune, the most distant of the large planets, 30 times the distance of Earth from the Sun, finally ceases its retrograde motion on Wednesday, the 22nd, and begins to move westerly against the stars. Uranus will follow in November. Since it was discovered in 1846 as a result of its gravitational effect on Uranus, Neptune has yet to make a complete orbit around the Sun (the whole circuit taking 164 years). Be sure to catch the Orionid meteor shower, which runs much of the month, and peaks on the morning of Tuesday, the 21st, with a rate of about 20 per hour. As Earth circles the Sun, we face in a different direction (if observing at the same clock time) each night, so the stars and constellations constantly shift to the west. Given 365 days in a year and 360 degrees in a circle (no coincidence), for the same clock time, the stars move westerly by a degree per night, seven degrees for each of Skylights' week. So this week, summer Cygnus and its Northern Cross lie seven degrees farther westerly than they did last week. The summer stars thus glide away, while the autumn constellations -- Pegasus, Andromeda, Cassiopeia -- take their places, and the winter stars - - in Orion, Canis Major, Gemini -- shift across the morning sky waiting patiently to take the place of the autumn stars, and so it has gone from time immemorial and will go into the infinity of the future.